Washcloths wholesale-Charcoal gray size 13X13, great for any commercial use or business that needs a heavy weight face towel/ washcloth extra soft, highly absorbent. Businesses are happy to go to extra lengths to please their consumer base. Hotels, salons and spas may provide luxury washcloths, for example, to enhance their clients' experiences. When these towels fade after only a few visits to the washer, though, that's a problem. We remedy that issue at Towel Super Center. Our premium washcloths use high-quality cotton to provide you and your clients with long-term service. Premium towels often carry a higher price tag, but we avoid that by selling ours in bulk for wholesale prices. Order a set of our premium washcloths in charcoal today to experience their first-class quality at a wholesale price. Premium-grade design: Made of a 100 percent terry-cloth cotton fabric, our premium washcloths feature double-stitched hems on all four sides. These design choices ensure your washcloths stay strong and thick instead of becoming stretched, faded and worn. Luxurious softness: Guests love soft towels. Our premium washcloths in charcoal meet their expectations by providing a luxurious level of softness — at a wholesale price for you — that lasts throughout washes. Use them at your salon or spa to increase your clients' satisfaction and comfort. Reliable absorbency: Our washcloths are thirsty. Rely on them to soak up accidental spills at your salon or spa, or use them to pat dry a client's face, neck or shoulders after a spa treatment. Our charcoal washcloths also dry fast, so you won't constantly have piles of wet, dirty towels to deal with. Flexible applications: The convenient 13" x 13" size of our premium towels make them excellent to use for washcloths. Use them during facial or hand spa treatments, or roll them up to provide a client's hands with cushioning while applying nail polish. Gyms can also find a role for our premium washcloths in charcoal. Pass them out to members for wiping off sweat or equipment. Discount pricing: Wholesale pricing is one way we lower the price of your towels. We also provide discount pricing. Our per dozen rates are as low as $5.99 — which applies to one dozen or nine dozen of our charcoal washcloths. Test out the bonuses of our towels by requesting a free sample. We'll send your sample within one business day to you. 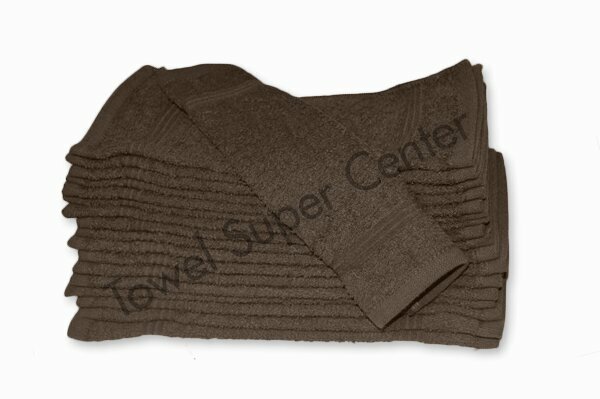 Our team at Towel Super Center provides high-quality customer service and products to you and your business. It's our passion and why we're accredited with the Better Business Bureau (BBB). We ship every order within one business day so that it reaches you as soon as possible. We also offer a return policy to ensure you're satisfied with your final order. Place your charcoal washcloths order today, so you can experience the lush softness and premium quality of our products.